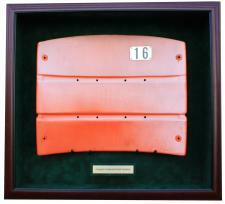 Candlestick Park Seatback Display Case | Sports Memorabilia! This high quality Candlestick Park Seatback Display Case can work for any seatback with a width of up to 21" and a height up to 18". The display is constructed of solid wood with a Mahogany finish, an elegant green suede mat and a glass front. These have museum quality 99% UV protection glass to help prevent fading of the autographs. Each display includes a lock and key feature to open the display from the front allowing access to the seatback so that the seatback can be easily removed at any time for adding autographs! The nameplate says "Original Candlestick Park Seatback". Custom wording is available. Please call. Each seatback display case comes ready to hang and the hardward for the wall is included. A 1" square of velcro is also included to apply to the back of the seatback to prevent it from moving during an earthquake. The case measures 25.5'' wide x 23.5" tall x 6" in depth. This custom seatback display case would normally sell for about $400 at a retail location. Our NSD price is much lower. Each seatback display case ships separately in its own box with extensive packing materials to protect the glass and display case during transit. The seatback displays do not include the seatbacks. 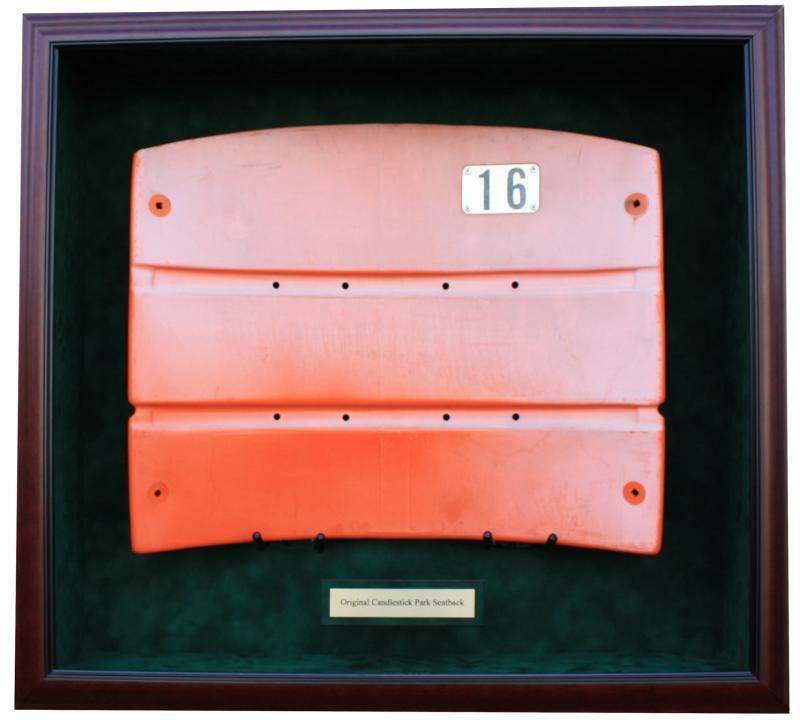 Click here Candlestick Park Seatbacks to see all the available autographed and unautographed Candlestick Park Seatbacks. $24.95 shipping per seatback to CA, WA, OR, NV and AZ. While not reflected in your shopping cart, $7.00 extra will be added to the shipping cost for all other contiguous states. If needed and at the same price, a different sized seatback display case is also available handling seatbacks with a width up to 16" and a height up to 21". This model is called our Verticle Large Model. Please phone us to order this model at (877) 466-6826. 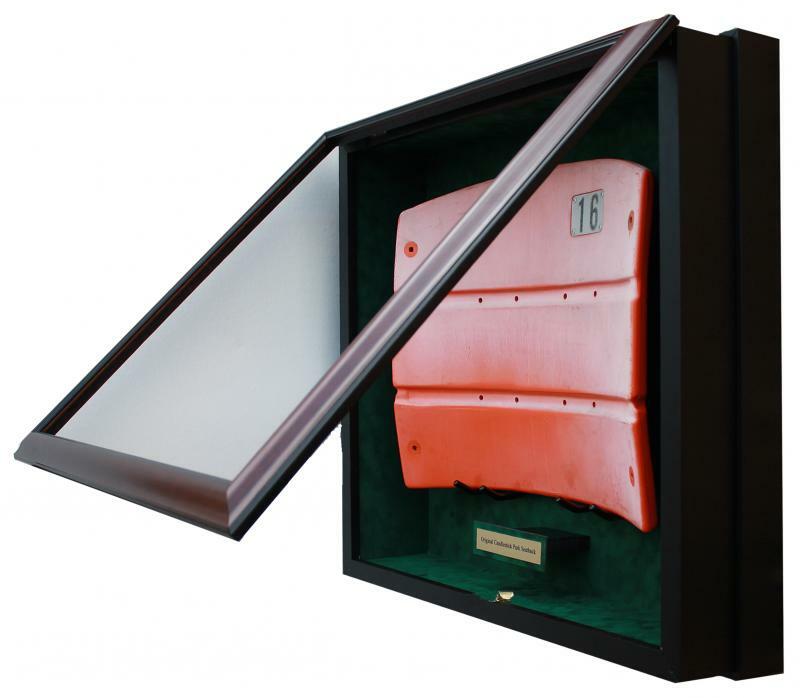 This case holds seatbacks like the large Dwight Clark model that we sell. Click here to a picture of this this model.